Chris Kelly didn’t sound too confident about what lies ahead in the M&H Logistics Scottish PGA Championship. “There’s a hell of a lot of crap golf to be played,” quipped the 40-year-old after completing his opening circuit on the King’s Course at Gleneagles. 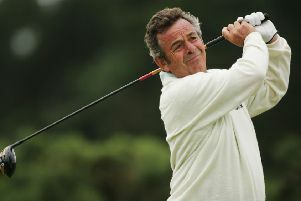 Having won the Tartan Tour’s flagship event twice before at the Perthshire resort and coming hurtling out of the blocks on this occasion with a stunning seven-under-par 63, though, he might well have been under-estimating himself. Admittedly helped by the fact the conditions weren’t nearly as tough as they had been for the day’s earlier starters as Storm Ophelia swept through – the contest will be decided over 54 holes after most of Monday’s play was lost due to fog – Kelly’s opening effort in the £53,000 event was right up there with his best on the Scottish circuit. The winner in 2003 and 2015, he birdied the third and sixth before producing good up and downs at both the seventh and 10th to keep his round going. He then finished 3-3-4-2-3-4 at the former home of the Bell’s Scottish Open to give himself a three-shot cushion after the delayed first circuit . The leader has been based since February at Stirling, where Iain Collins, the long-serving professional, is stepping down at the end of the year. “I’ve enjoyed it when I’ve played this year and hopefully that will continue over to the next two days,” added Kelly. His closest challengers are Paul Robinson (Largs) and Paul O’Hara (North Lanarkshire Leisure Ltd) after they carded 66s, with Greg McBain (Newmachar) and Jason McCreadie (Largs) two strokes further back in joint-fourth. On a tough scoring day, Graham Fox (Clydway Golf) was the only player in the 66-strong field to break par with his 69. Robinson has been quiet since winning the P&H Championship two years ago. His encouraging effort was illuminated by an eagle-3 at the sixth, where he rolled in a 25-footer before knocking in an even longer one for a birdie at the 10th. O’Hara, last year’s runner-up after Gareth Wright eagled the first hole in a play-off, launched his bid to go one better with a bogey-free effort. He’s been the Tartan Tour’s dominant player this season and would love to add this title as the icing on the cake. Wright, who’d been among a small group of players to get started on Monday before fog forced play to be abandoned, resumed his round when the wind was at its strongest and had to settle for a 75, leaving him 12 off the pace in joint 34th place. Asked if play should have started on Monday, the West Linton professional said: “I’m not an official, so I can’t comment.” He didn’t want to say too much, either, on being in the first group. “That was a wee bit suprising,” added the Edinburgh-based Welshman.